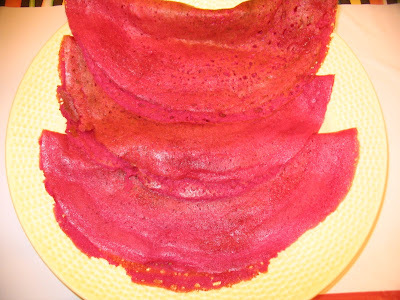 This beetroot dosai is which I often make at home , this is really delicious and healthy. Even peoples who don't like beetroot they love this. This is so easy to make. It will very well crispy. So go ahead and try. Leave a feedback if you really like it. This can be made easy when you have dosa batter at home. A variation for usual white dosai with more healthy form. Puree the chopped beetroot, jeera(cumin) and green chilli. Mix it with dosa batter and add little salt, coriander leaves. Make dosas thin and crisp. Serve with either coconut chutney or garlic chutney. Similarly we can do with carrot, mixed vegetables, Tomato. Top this with onions to make beetroot onion dosai . Those flyin saucers luks awesome...creativity at its BEST!!!!! !